On US/Russian electoral interference in other countries. (This seems broadly correct). Not so keen on intervention. 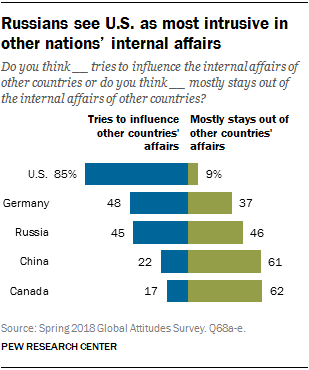 In the previous PEW poll, it emerged there are some countries that are more Russian nationalist (e.g. Serbia and Armenia) than Russia itself, at least on this question. This poll was ofc carried out before the pensions reform dropped ratings by 15% points. 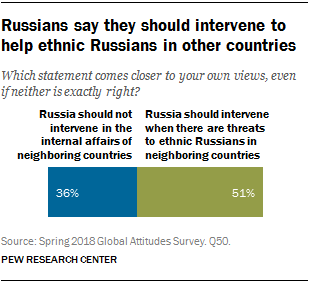 16 Comments to "New PEW Poll on Russian Attitudes Towards the West"
With the first White-owned farms being forcibly confiscated by the RSA authorities, is there any update on the 15K farmers who were granted refuge? (For once, we can use the term refugee without irony). Are any on route? Have any settled yet? Did the news blow up in Russia or did it sail under the radar (especially considering that the announcement was close to the World Cup events)? It was written in Kommersant a couple of weeks ago. It was a single family which was visiting, with interest as informal delegates for their wealthy community (which was about 50 wealthy Boer landowning families). In the end, they were not so interested in Stavropol region in particular (I think because there was not land for them to buy, but only to rent). Also they are interested in visiting other parts of the country, and also they are interested in Hungary. These were wealthy people (who have options to choose between countries). They are interested in Russia not from "desperation", but for reasons that they want to live in a more socially-conservative environment. If they wanted, these wealthy Boers could go to any country in the world (UK, America, Australia, etc), but it's Russia interests them much more, because they want a more conservative society. So they are going to continue visiting different places (including different parts of Russia, and also maybe countries like Hungary), and then make a decision. 51%. Why are Russians unwilling to take their own side, even after all of the disasters of the last 20 years? At least it’s a majority I guess. These public attitudes can shift quickly and dramatically under the influence of media propaganda. They are irrelevant basically. 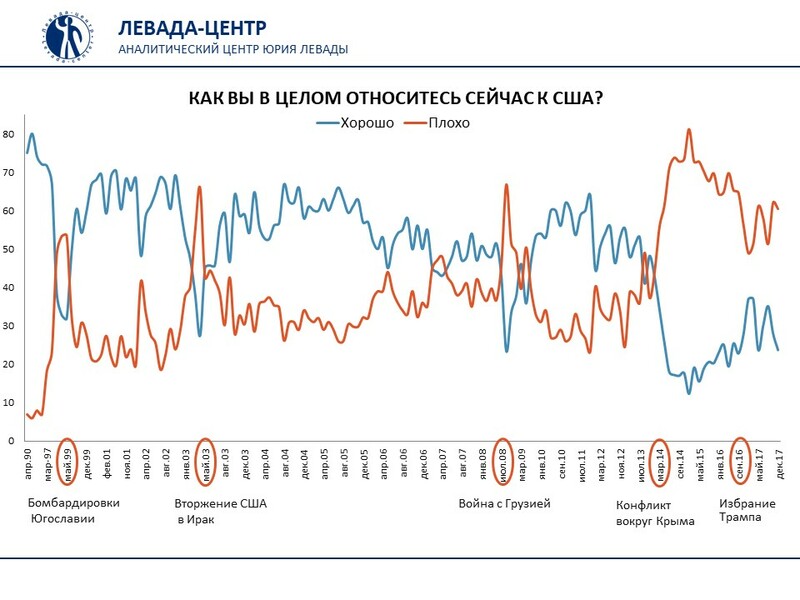 More Russians have positive rather than negative sentiments toward the U.S. for the first time since 2014, following President Donald Trump’s controversial summit with President Vladimir Putin, a new poll has revealed. The article attributes the shift to Helsinki summit, but real reason appears to be World Cup in Russia: state-tv took a break from its usual anti-Western programming during this time. People are gullible and stupid. These were wealthy people (who have options to choose between countries). They are interested in Russia not from “desperation”, but for reasons that they want to live in a more socially-conservative environment. If they wanted, these wealthy Boers could go to any country in the world (UK, America, Australia, etc), but it’s Russia interests them much more, because they want a more conservative society. 51%. 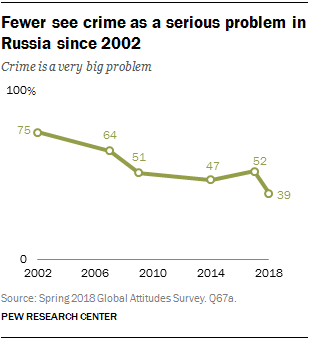 Why are Russians unwilling to take their own side, even after all of the disasters of the last 20 years? At least it's a majority I guess. Lol, true, I noticed also how public opinion changes quickly in these polls. I think this changeability, is not completely "stupid", but what you can expect when you ask random sample (i.e. mainly nonpolitical people) about topics (other countries) which they do not closely study. For example, looking at enemy countries table for the attitude to Turkey, in Levada Centre’s annual friends and enemies rankings. In 2015, only 1% of respondents say Turkey is a historically arranged top 5 enemy country. In 2016 (after events in Syria), 29% of respondents, say Turkey. In 2017, 8% say Turkey. And in 2018, 3% of respondents. 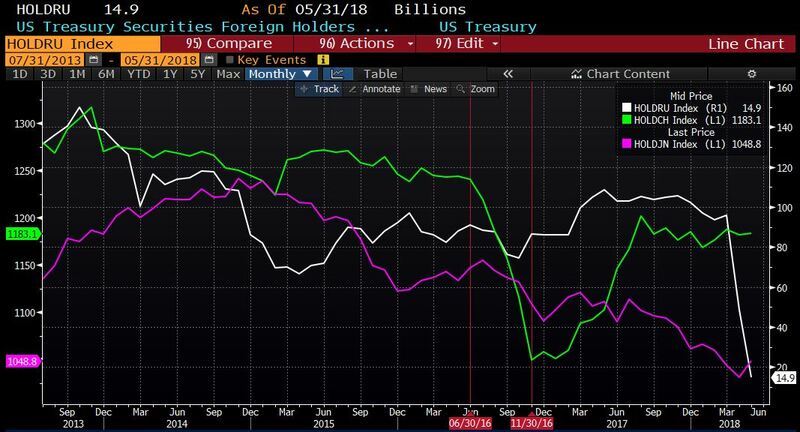 Between 2015 to 2018 - from 1%, to 29%, to 3%. Public opinion is whatever the people are told to believe this week. If you ask people for their opinion they'll tell you what they think they're supposed to say. The fact is that on most issues the public doesn't have an opinion. There is one exception to this rule. People do have opinions on things that hit them in the hip pocket. If the government does something that will cost them money personally they will certainly have an opinion on that. If a government wants to be popular it keeps that in mind. I think this changeability, is not completely “stupid”, but what you can expect when you ask random sample (i.e. mainly nonpolitical people) about topics (other countries) which they do not closely study. Between 2015 to 2018 – from 1%, to 29%, to 3%. This is a real problem with democracy. It is always rhetorical democracy, ie 'managed' democracy. But that is necessary with democracy going all the way back to ancient Athens. The mob is very easily swung around and manipulated and completely irrational. The whole concept is akin to the idea of you having cancer, so go ask 3 plumbers, an accountant and a farm laborer what kind of treatment they think you should have. From 100% supporting total genocide to 49% support in 1 day. How the hell did anyone think universal suffrage was a good idea? 'You don't have any idea what you're talking about and you never paid attention to this issue before so here, you decide'. The only real rational behind something like expanded suffrage - especially of incompetents - is that letting uninformed people vote actually makes it easier to manage and sway the vote, so actually less democratic in the reality behind the curtain. It disenfranchises what democracy there was between qualified voters with skin in the game by diluting their weight and in turn empowers flashy demagogues. This is a real problem with democracy. It is always rhetorical democracy, ie ‘managed’ democracy. But that is necessary with democracy going all the way back to ancient Athens. The mob is very easily swung around and manipulated and completely irrational. The whole concept is akin to the idea of you having cancer, so go ask 3 plumbers, an accountant and a farm laborer what kind of treatment they think you should have. How the hell did anyone think universal suffrage was a good idea? ‘You don’t have any idea what you’re talking about and you never paid attention to this issue before so here, you decide’. The only real rational behind something like expanded suffrage – especially of incompetents – is that letting uninformed people vote actually makes it easier to manage and sway the vote, so actually less democratic in the reality behind the curtain. It disenfranchises what democracy there was between qualified voters with skin in the game by diluting their weight and in turn empowers flashy demagogues. The only real rational behind something like expanded suffrage – especially of incompetents – is that letting uninformed people vote actually makes it easier to manage and sway the vote, so actually less democratic in the reality behind the curtain. Which is precisely why suffrage has been expanded. The purpose of any electoral system is to throttle the popular will. It is to provide the illusion of democracy. Democracy is just a fancy name for tyranny. Public opinion is whatever the people are told to believe this week. If you ask people for their opinion they’ll tell you what they think they’re supposed to say. The fact is that on most issues the public doesn’t have an opinion. I give it 6 months of exposure to Russian TV (which was banned in the Ukraine in 2014), and Ukrainian opinions will converge with Russian mainstream views on this subject. Electoral systems SLOW DOWN ill-considered fads. Most of the radical innovations of USA Progressives, are countered by delay. USA Progressives favor communism, &/or anarchy which leads to authoritarianism. Electoral systems foster stability, IMHPO. Россия, которой всякие там интеллектуалы и эксперты не нужны, проиграла борьбу за историческое сознание жителей Украины. I think this is what would have happened in 2014 in most of the eastern provinces. (AP disagrees). Not sure this would happen in 2018. USA Progressives are the willing tools of capitalism. Check out this Gallup poll. 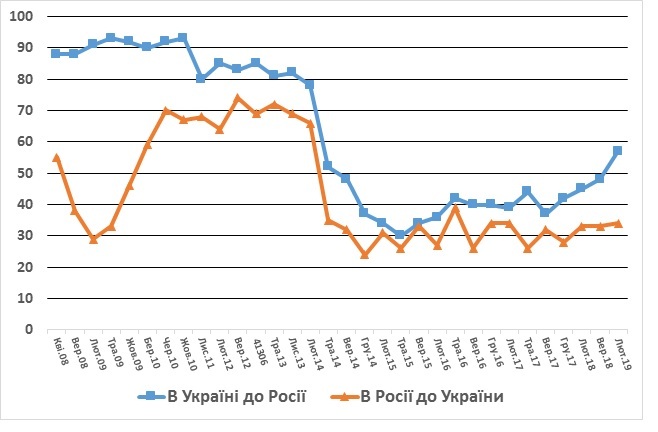 It shows evolution of Ukrainian attitudes on relations with Russia over the past few years. There is a big and growing divergence between Galicia and the rest of the country. "AP" is just a resident Galician emigre. There is a big and growing divergence between Galicia and the rest of the country. “AP” is just a resident Galician emigre.